"It is a question of looking for a language or a plastic sign able to convey at the same time the world of the senses as an emotion and the spiritual world as a final revelation; to uncover, by authentically plastic means, the spiritual equivalence of the outside world and of a more interior world." This piece was painted in 1949 in the studio situated on the second floor of the house with a garden the artist had been renting for almost ten years in the area of Montparnasse, at 203 rue de Vaugirard, in the 15th arrondissement in Paris, where Manessier lived with his family and worked until it was demolished by property developers in 1973. For Manessier, 1949 represented his establishment as a painter on the threshold of an international career. In fact, that same year-three years after the exhibition at the Galerie Drouin in Paris with his friends Jean le Moal and Gustave Singier, which attracted particular attention-Alfred Manessier, then aged 38, held two personal exhibitions in Paris. In the month of April, the Galerie Jeanne Bucher presented his first lithographs and a set of paintings on the subject of Easter. His second exhibition opened at the end of the year at the Galerie Billiet-Caputo; the critic André Warnod acknowledged Manessier as: "a greatly gifted colourist who produces sumptuously orchestrated harmonies and symphonies. The subjects he deals with are obviously more suggested that represented, but they are nevertheless present there." 1949 was also marked by the continuation of the building work on the church of Bréseux, a small village in Franche-Comté, where Manessier had been summoned in 1948 by a daring young priest from the dioceses of Besançon, Canon Lucien Ledeur, to create his first stained-glass windows which proved to be-beyond the scandal they caused-exemplary, since they were also the first in the history of sacred art to dare be non-figurative. This non-figurative approach, characteristic of Manessier's style in that period, is expressed in its purest form in this painting in a "12 landscape" format. Unfortunately, we have very few elements which enable us to reconstruct a rich individual history: there is no mention of it in exhibitions, only the trace of a public sale in Stuttgart, followed by its entry in 1961 in Baron Hans Heinrich Thyssen-Bornemisza's prestigious collection, where it has been kept away from the eyes of the public until now. In this poetical composition, at first sight mysterious and "abstract", we discover a partial network of blue lines and darker overtones which stand out against a juxtaposition of shapes and planes coloured differently, interrelating through the pictorial interplay of cold colours (modulation of blue and green hues with a turquoise dominant) "in the surface" and of warm colours (modulation of madder red, orange and reddish ochre hues.) "in the background". A few discrete touches of lighter shades of yellowish ochre, bluish grey and mauve give an impression of depth. When listening to this painting, whose major chord creates a lively harmony between all these different colours and saturated qualities of joy and freshness, do we not suddenly hear an echo of the happiness which the artist found in the act of painting, for him essentially an act of love? And let us simply follow the writer Jean Guichard-Meili when he wrote: "those who can contemplate in silence and peace the works of Manessier (which were painted for silence and peace), feel rising in them that impetus, that jubilation of the eye and the heart together, while they feel overwhelmed by the presence of the mystery approaching, rising to the surface of the painting. A mystery transformed into spiritual light and celebrated, in joy, by a grateful man." Thematically, this rhythmic composition of traits and signs is different from the series of works painted in 1949 to celebrate Easter and the Passion of Christ. 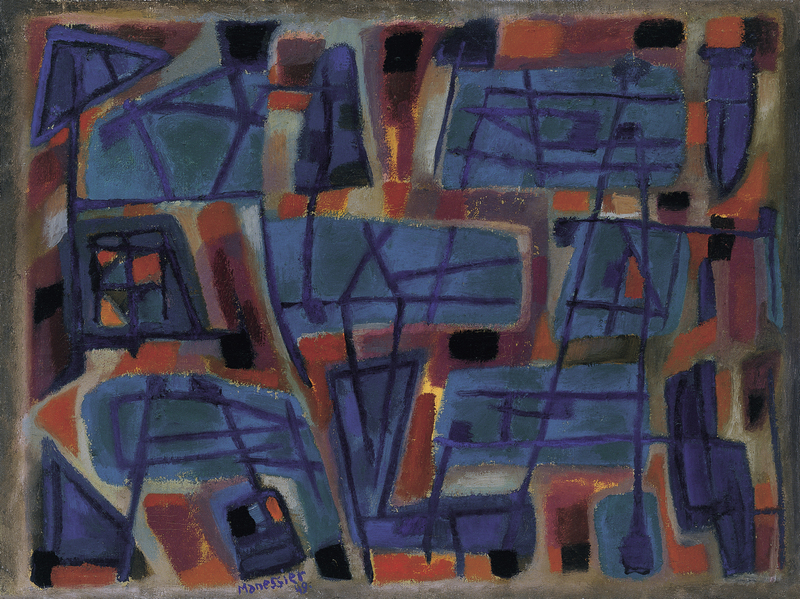 With the help of his wife, Alfred Manessier used to give every work he finished a title to indicate his intention with regard to the subject treated. The very vague title of this painting-Blue-Red Composition-was certainly not their choice, as it is written in German on a canvas frame which does not seem original, and was probably due to the requirements of the Stuttgart auction of 1961. But did it have an original title?.